Ephesians 1:9-10 is a little more difficult for me to understand. After Paul tells us in verses 3-8 that we were saved, before the foundation of the world, from our trespasses and sins, and redeemed by the blood of Christ, according to the riches of His grace, which He lavished upon us in all wisdom and insight, Paul then tells us the mystery of God's will is made known to us, according to His (God's) purpose. The Mystery of God's will? At first, I was concerned by this. I felt left out of a big secret. Then, I read verse 10 again. It's "a plan for the fullness of time, to unite all things in Him, things in heaven and things on earth." I suddenly realized God calls whom he wills because He will be glorified completely when all things are united in Him. The Angels in heaven will be united with his creation on earth. We will worship Him together for eternity. The mystery is only "a mystery" to the non-believer. Because I've been called to salvation, I have the understanding that all things are to the glory of God, and His plan to unite all things in Him is easy to believe and understand thanks to that calling. I can't help but think about those who He did not call to salvation. They will glorify Him too. They will understand God's wrath and worship Him through their eternal suffering. All of God's character will be worshiped. The plan of God, set forth in Christ, is to cause all things to glorify Him. Those of us who are saved from sin by Christ, glorify God through an understanding of the riches of His grace. Those who reject God, and reject the plan of salvation through Christ, will glorify God through an understanding of the power of His wrath and the penalty for sin. Personally, I am so glad I've been chosen by God. I want to be united in heaven with the angels in eternal worship of God. Ephesians 1:7-8 are a huge and impacting set of verses for me right now. Having just lost my job, and in a huge way because God decided He'd be more glorified without me in the jail, I feel so wretched and sinful. I feel unworthy, undeserving of His grace or to even be called an adopted son of God. But, redemption through the blood of Christ, forgiveness for my trespasses, are mine through the riches of His grace. Even a sinful, disgusting failure like me, has forgiveness which comes from the Almighty God. How awesome! And this grace is "lavished" upon us. Lavish can also mean plentiful, generous, abundant, sumptuous, copious, bountiful, extravagant, heaped, smother with, and bestow upon. God’s grace is bountifully heaped on us. And again, it’s undeserved. It’s done by God through His wisdom and insight. My God's grace is all consuming. Even these things we consider to be "bad", like being fired from a job, are really God's grace being shown in a different way than we would expect. Sometimes it's beyond our ability to understand. God is great. God is grace. I am nothing without His grace in my life. The iPhone's possibilities are endless. I'm still mad that Steve Jobs and Bill Gates don't see the potential gain in creating a small device that can be our full computer. If something like the iPhone that's able to hold all our documents, photos, music, and other files, was then given the ability to modify and manipulate those files (i.e. word processing, photo editing) I think it would truly become the most coveted piece of technology to date. I understand the limits to graphics for games, CPU power for performance, memory for speed, and other limitations. And Steve and Bill are right in that, there will still be a need for a full home computer with full power. But, with all the hacks people are doing to the iPhone (games, internet programs, copy and paste, video, document viewing) it seems obvious to me that people want more out of their phone. The iPhone is the first glimpse people have into that future possibility of having everything with you all the time. Create a docking station that connects the iPhone to a full size monitor and keyboard. Have a full strength computer turn the iPhone into a hard drive that accesses the programs and files from the flash memory on the phone to run a full computer at full computer power. Then, when you undock, you can take all that ability with you in your pocket. And you have your complete e-life on the go. I wish I knew people with the smarts to do this. I would love to go tell Steve about it. Maybe Google would be interested. Here's my whole patented (haha) idea: Phone (similar to the iPhone, maybe a keyboard feature, Sony's got a new one) Large SSD (that's the harddrive, saw a small one up to 256GB ) Office products Photo programs Games 3rd party app access Home Sync program (becoming a hard drive used by more powerful graphics/CPU/memory, auto back-up to home base hard drive) Okay, so this is a boring entry, I know. I just think it would be cool to have lots of functionality on the go. Sometimes I'm out and want to show a friend a story I wrote or a song I arranged. When I'm out car shopping I think, "I'd be nice to have access to a spreadsheet to see if the numbers they're quoting are really as great as they're saying." Anyway, here's the video that started this whole thought today. 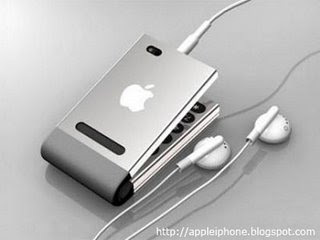 I watched only 30 or 40 seconds, but it shows another creative way someone modified the iPhone. Yeah, this is a video of the upcoming slider phone from Sony Ericsson. Looks great right? IT STILL PALES NEXT TO THE iPhone. If reasonably priced, I'd go for it though. I do love my Sony. I've been reading Ephesians for a few weeks. I ended up writing a new song about God's grace and all things being for His glory. Lisa and I started going to a new church and the pastor is teaching through Ephesians. This morning I read Eph 1:1-6 again. There is so much in that little section of this book. We were chosen before the foundation of the world, to be holy and blameless. Because God loved us, he predestined us to adoption. Adoption in biblical times, according to my pastor, meant the adopted was equal to any other family member. They were given the same access to all the benefits of the family. We are adopted as sons of the Almighty God. Where else and what other family has eternity in Heaven as one of the things offered? Peace, joy, comfort, rest, provisions. God adopted us into His family with all these benefits, and the biggest and best is salvation from sin. We were called before God even created us or the world. And we were predestined to this salvation from our sin, just because God decided to do it. Ephesians 2 tells us it's not from our works or something we've done to earn or desire this salvation. We have nothing to boast about. It is all by God's choosing. Wow!!! I'm so "lucky" that's the case. I can't seem to do much right at all on my own. I'm always mad at myself for something I've done wrong. I'm a disgusting sinner. It is only my God's grace I am saved from this sin. This is a quick entry. I stopped at an AT&T store on my way home tonight and looked at several different phones. I can't believe the rest of the junk that cell phone companies have been selling us. Yes the iPhone is toooooooooo expensive, but it is BY FAR a superior phone to the rest of the crap that is out there. And yes, I know I've used a bunch of fake mock-ups for the iPhone every time I've done a story. It's fun. Can't wait for the iPhone2 and all its glory. This is a cool video I saw over on Crunch Gear. Did this really happen? Cell Phones are evil. Yikes. Because the video looks so home made, it almost seems like you witnessed a real monster. That was a cool video. 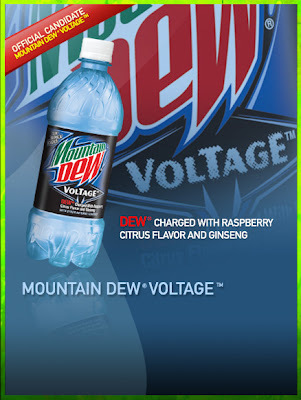 The first of the three new flavors, Voltage, is Raspberry Citrus flavor with Ginseng. It's a light blue/purple color and tastes just awful. My goodness, it's so gross. Do you remember Otter Pops? Think about letting the blue one melt, adding some more sugar and CO2, and calling it a "new flavor" of Dew. Yeah, it's wrong. Why do they have to use the fake-est (<--- not a real word) flavoring? Let's recap the good stuff: Live Wire=Orange, Code Red=Cherry, and the original=nectar of life. Why wasn't the Halo version a good mix of the Live Wire and Code Red? Why was it so bad? And why is Voltage so bad? So gross? For the record, I tried it out of a (plastic) bottle, over ice, and with a grilled cheese sandwich. I gave the beverage 3 chances. My wife thinks it tastes like New York Seltzers. Do you remember those for the 80s? Strike One with the new flavors. 2 more to go. Stay tuned. Also, if you taste the new flavors, add a comment. Go out and taste Voltage for yourself so you can add your review to this one. I'll try to stay up to date with the actual vote going on at the DEWmocracy site. True fans of Star Trek will recognize the LCARS like touchscreen system in this video. It appears to be in another language so I can't read what the functions of this home control unit does, but you can see it closes a shade for the window. From things I've seen in the past, you can most likely control anything that runs off of electricity. I'm thinking of things like home entertainment and music, lights, heating and air, and more. I also liked that it became a fish tank at the end. You could make it into a digital photo frame, rotating through a library of pictures. Looks like an agreement may have been reached with UAW Local 602 which should result in the popular Lambda vehicles (Buick Enclave, Saturn Outlook, and GMC Acadia...and soon a Chevrolet version) resuming production. Oh but at the same time I read this information, I found another union striking on GM. The CAW (Canadian Auto Workers). WHAT?!?!?!? The stinking Canadians? There's a whole other issue American car manufacturers have. They build too many different vehicles in too many different places all over the world. The few times I've been out of the country, I've seen some great models that they don't build here. How about this, take all of the best in every country, build just those models, and offer them to the world. What's that? World car? Yes, it's been thought of, tried, and there's been some failures. But, if it's done better, it would work. Oops. This was 1.5 but it almost became 1.75. I’ve called this entry “The Automotive Industry of Doom Part 1” for two reasons. One, Indiana Jones and the Kingdom of the Crystal Skull is coming out May 22, 2008. 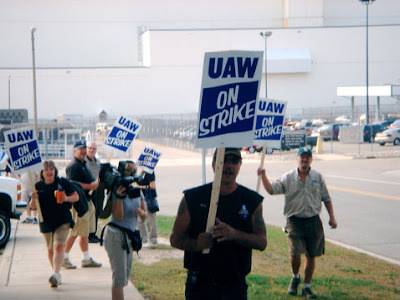 And Two, I’ve been working on a fairly long rant about the UAW (United Auto Workers Union) strikes and their affects on American automotive companies. The long rant is saved on my laptop, which is currently undergoing so work due to issues with heating up and a hard drive that's full. The long rant should follow soon. The problem I see is the idea of the union in the first place. If we go way back to when unions were started, they had a purpose they served in protecting the rights of the workers. The problem today is their power is out of control and their affect on businesses, and subsequently, consumers is enormous. My first example is General Motors (GM). GM has been hit with several strikes by the UAW that include shutdowns of plants that produce popular models (Malibu, Acadia, all the truck lines, etc), shutdowns of plants that supply parts for various vehicles (axles, plastics), and now another one that affects metal stamping plant (doors, hoods). Now it may seem like GM has some serious issues with the treatment of its employees, but as one auto blogger writes, “Is the United Auto Workers (UAW) subjecting GM to a death by a thousand cuts? What's the point of negotiating a national contract if every plant covered by the agreement goes out on strike over "local issues? "” (The Truth About Cars). You see, GM already dealt with a national contract for the members of the UAW, but now there are other local unions and smaller unions such as American Axle’s union that are attacking GM. Theories are that these smaller unions want in on the UAW contract and agreements. Some even believe these unions want to join the UAW. And the UAW, it’s the same union that represents the workers over at Ford and Chrysler. They’ve become so powerful, they tell the auto companies what they will build and, probably, not build. I read an article a few months back about the Ford Ranger. It’s not even a decent selling vehicle anymore, but the UAW wants to keep building it for a couple of years. Why? Because this will keep a specific group of union members in that job. Sure, this hurts Ford and over time these types of decisions will catch up with the profitability of the automotive companies, but the unions don’t care about that. They don’t see the larger picture. Instead, all 3 American automotive companies are heading towards Chapter 11. One blog even said GM may file this year. Of course, then the government will work on a bail out program, loaning our tax dollars to these businesses; these businesses that can’t seem to build what the people want. Why are foreign cars so much more desirable? Why are all 3 American companies struggling? It’s a tough question. And I’ll work on that answer in the next installment of The Automotive Industry of Doom. If this video is in fact real, it's no wonder we have so many illegals in this country. If the boarder agent running around like a crazy person can't say this is video from his first day, I'm willing to bet he's had a pretty unsuccessful career. Enjoy. And, nice music. This is a cute little song I found through Crunch Gear. More about TFU (The Force Unleashed). Awesome. And you can get the game on every system. Wii, PSP, PS2, PS3, XBox 360, Nintendo DS. Oh that's right, I don't see a PC version here. I guess it's time to buy an HDTV and a PS3.